This is a lovely pie for a frosty day. 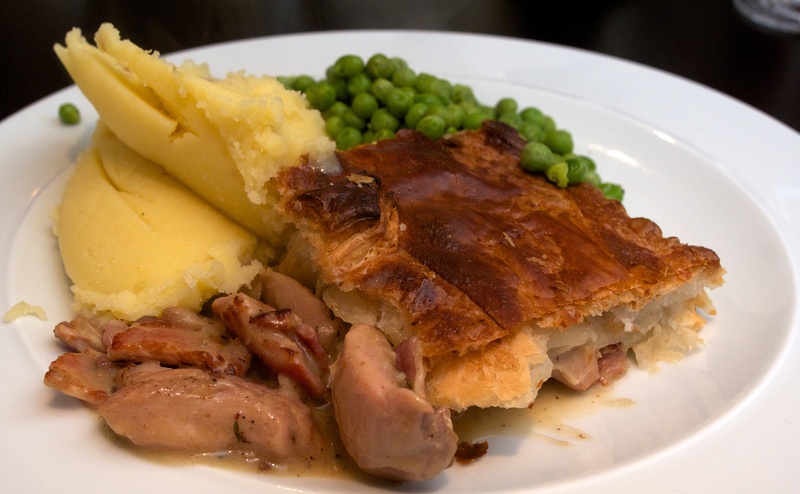 Serve with lots of mashed potato and peas. Wine Suggestion: this dish needs a white wine with a medium body as there is some subtlety at play with the flavours and weight. Classically we’d pair a sensitively oaked chardonnay with an earthiness and minerality so a better Maçon or Côte Chalonnais would be great. To step outside the box though look to a Vin Jaune from the Jura which adds a layer of nutty, yeasty characters, a lovely freshness of acidity and a rustic earthiness. Don’t go too sophisticated as this is a wholesome, honest pie. Heat the oil in a large, non-stick frying pan. Season the chicken and fry in batches until golden brown. Remove the chicken from the pan and add the bacon. Fry for about 5 minutes or until crisp. Add the onions, mushrooms and thyme, then fry on a high heat for about 3 minutes or until the onions start to colour. Add the flour to the pan and cook, stirring, for 1 minute. Take the pan off the heat and gradually whisk in the stock, followed by the milk, then return the chicken to the pan. Bring to the boil and simmer for 30 minutes. Spoon the filling into a large pie or baking dish (approx. 20 x 30 cm) with a lip and leave to cool. Roll the pastry out onto a floured surface. Cut a long strip as wide as the rim of the dish and, using a little of the egg, fix to the edge of the pie dish. Brush with egg, then lift the rest of the pastry onto the pie. Press the edges together with your fingers and trim with a sharp knife. Brush lightly with egg to glaze and bake for 30 minutes or until risen and golden brown. on 6 May 2015 at 6:37 am | Reply FOOD IS LIFE!